Edison Research and Triton Digital have released the 2018 edition of the Infinite Dial Australia study, It is the second investigation from the pair detailing the latest trends and habits for listeners down under. The results are pulled from a national telephone survey of more than 1,000 Australians aged 12 and up during the first quarter of 2018. During the period, 88% of the respondents reported listening to AM/FM radio in the past week, up from 85% in the 2017 results. The share was also larger than the 65% weekly listening reported in the U.S. Infinite Dial report. About a quarter of Australians said they own zero radios, while 65% said they have between one and three. Radio sets were not the only sources of listening: 21% of respondents said they use devices such as mobile phones, computers, or televisions to listen to radio at home. The rate of listening on other devices was highest for the age 25-54 age bracket at 28%. 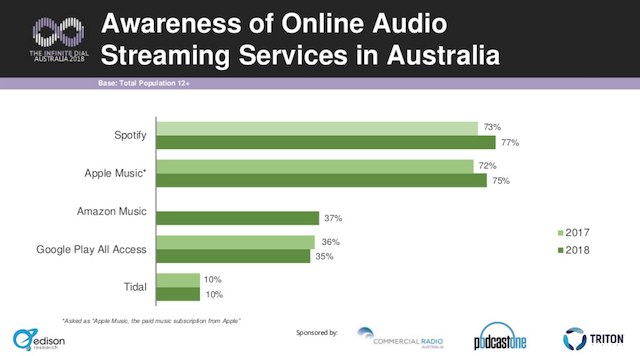 Monthly online listening in Australia for 2018 was 52%, less than the 57% reported in Canada and 61% in the United States. Spotify had the highest rate of awareness for online audio streaming services, rising from 73% in 2017 to 77% in 2018. Apple Music also saw increased awareness from 72% to 75%. Spotify had the highest amount of online listening in the past week at 26%, compared with 21% in the previous year. Apple Music’s share of listening rose from 6% to 7%. Amazon Music was only tracked in 2018, and it had just a 1% share. Google Play All Access kept a steady 2% across both 2017 and 2018. 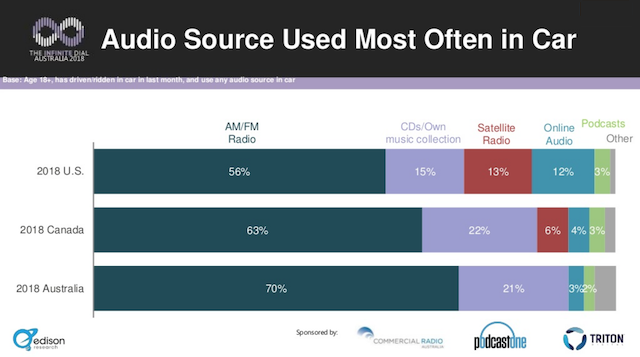 For car listening, AM/FM radio remained the top choice for audio, holding a consistent 89% share. CD players posted a dip from 59% to 52%, and DAB+ radio receivers declined from 10% to 6%. Podcast listening in cars edged up from 8% to 9%. Online audio streaming services also posted an increase from 8% to 10%. Compared with the other Infinite Dial markets, Australia had a much larger share of car listening dedicated to AM/FM radio. Australia had smaller figures for satellite radio and online audio consumption in cars. This Infinite Dial report also covered data about smart speakers. Google Home had a big lead in awareness at 61%, compared with 28% for Amazon Alexa. Ownership rates are still in the single digits, at just 5% for the overall population in Australia. Uptake of this product segment is higher in both the United States (17%) and Canada (8%). 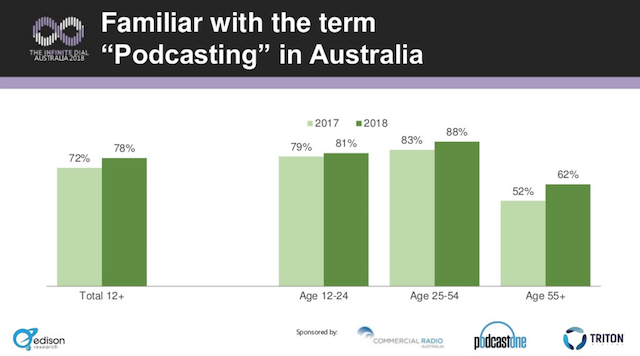 Familiarity with the term podcasting was 78% in Australia, and all age brackets increased from their 2017 rates. For the age 12-24 group, the 2018 response was 81%. A whopping 88% of ages 25-54 are familiar with podcasts, while only 62% of the over-55 group said so. Monthly podcast listening rose slightly to 18%, while weekly listening is 13%. Australia is slightly trailing the weekly podcast rates reported in the United States (17%) and Canada (19%). Australians listen to an average of five podcasts a week.